New Jersey Gov. Chris Christie plans to speak with Rutgers officials about a report that the woman hired to clean up the university's scandal-scarred athletic program quit as Tennessee's women's volleyball coach 16 years ago after her players submitted a letter complaining she ruled through humiliation, fear and emotional abuse. Christie told NBC 4 New York Sunday that he is aware of the report about Julie Hermann in the Star-Ledger, but wants to get more details before commenting. "I’ve got to talk to university officials and try to get the complete story," Christie said. "I wasn’t involved in the search at all and I haven’t met Ms. Hermann so let me talk to university officials." 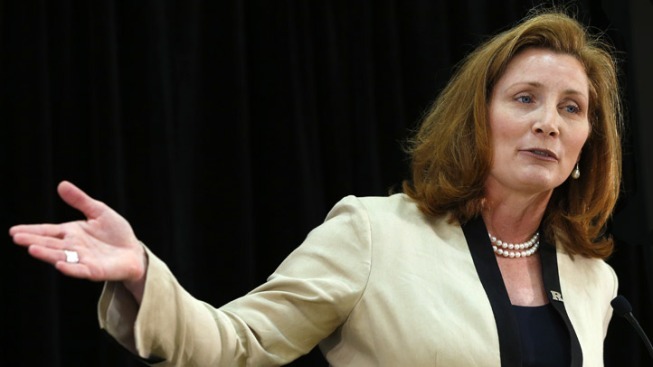 Rutgers University has named Julie Hermann its new athletic director. In her new role, Hermann will become one of just a handful of female athletic directors at top sports schools. Brian Thompson reports. On Saturday, the Star-Ledger reported that Tennessee players wrote that the mental cruelty they suffered when Hermann was coach was unbearable, saying she called them "whores, alcoholics and learning disabled." Hermann was hired on May 15 to replace the ousted Tim Pernetti, who was let go after basketball coach Mike Rice was fired for abusive behavior. On June 17, the 49-year-old Hermann is set to become the first woman to run the Scarlet Knights' athletic program and one of three female ADs at the 124 schools playing at college football's top tier. 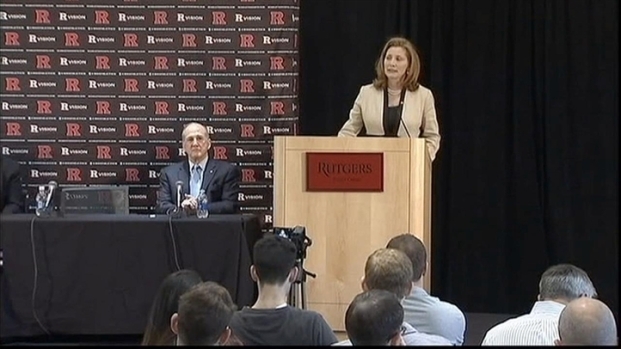 However, it's uncertain whether the report will force Rutgers to re-consider the appointment. It also could give impetus to those who want new university president Robert Barchi to step down after yet another black eye for the state's largest university. Hermann was not immediately available for comment, but she told the Star-Ledger that she did not recall the Tennessee letter. The newspaper said when it was read to her by phone, she replied, "Wow." Rutgers board members Candace Straight and Joseph J. Roberts Jr. did not return telephone calls by the AP seeking comment. 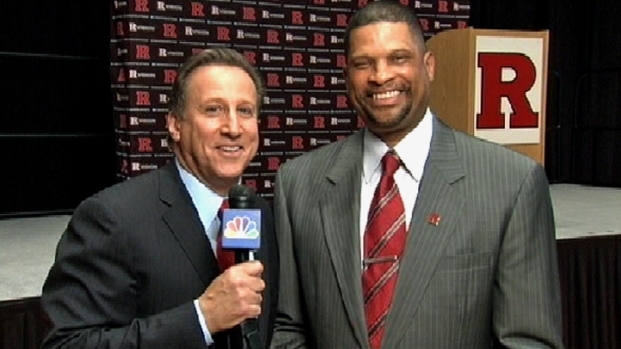 New Rutgers basketball coach Eddie Jordan talks to Bruce Beck about his plans for the scandal-scarred team. "The questionable decision-making at this program so heavily funded by taxpayers continues to astound me," Assembly Speaker Sheila Oliver said in an email to the AP. Louisville Athletic Director Tom Jurich, who was Hermann's boss for almost the last 16 years, was surprised by the report. "For me to say this is a shock, it totally is because of the tremendous job she did for me," Jurich said Sunday in a telephone interview. "When she was with me at Northern Arizona, her players adored and loved her. I never heard anything about this at all from the Tennessee players and a lot of them have come through Louisville a number of times. Everybody is always singing her praises." The Star-Ledger report said that wasn't the case late in her coaching career at Tennessee. In the letter submitted by all 15 team members in 1996, the volleyball players said Hermann called them "whores, alcoholics and learning disabled" and they wrote: "It has been unanimously decided that this is an irreconcilable issue." The players told The Star-Ledger that Hermann absorbed the words and said: "I choose not to coach you guys." Hermann had promised a restart the Rutgers' athletic program following the ouster of its men's basketball coach and the resignation of other officials. Rutgers' problems started in December when Rice was suspended three games and fined $75,000 by the school after a video of his conduct at practices was given to Pernetti by Eric Murdock, a former assistant coach. The video showed numerous clips of Rice firing basketballs at players, hitting them in the back, legs, feet and shoulders. It also showed him grabbing players by their jerseys and yanking them around the court. Rice can also be heard yelling obscenities and using anti-gay slurs. The controversy went public in April when ESPN aired the videos and Barchi admitted he didn't view the video in the fall. Rice was fired and Pernetti, assistant coach Jimmy Martelli and interim senior vice president and university counsel John Wolf resigned. Even when Rutgers has made a move that was well received, there was a glitch. After hiring former Scarlet Knights star Eddie Jordan to take over the basketball program, the university made the mistake of calling him a graduate when he had never finished work for his degree. Now the Hermann problem has popped up when many thought the worst was over, and the athletic department could start focusing on its move to the Big Ten in 2014. Brian Thompson contributed to this report.